Here’s a great, classic recipe for Italian-Style Meatballs. These moist, tender Italian-Style Meatballs are a savory combination of ground beef, perfectly seasoned onions, garlic, Parmesan cheese and other herbs and seasonings. Soak bread in milk in a large bowl. After the bread soaks for 4-5 minutes, add eggs and beat with the wet bread. Add onions, garlic, Parmesan, parsley, salt and pepper and stir to combine. Add the beef and gently work the mixture to combine the ingredients but do not over mix. Wet your hands and roll out the meatballs into a round shape. Place in the refrigerator to firm up if the mixture gets too warm. They will keep their shape better when cooking if not too soft. 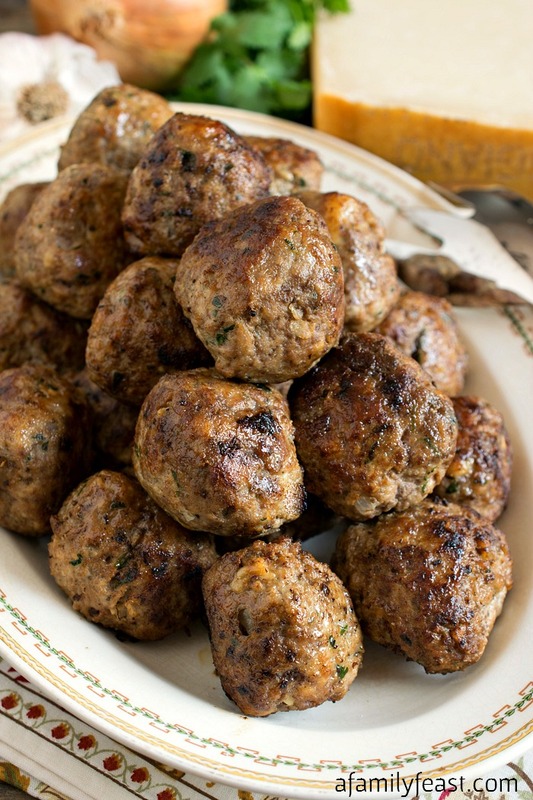 The meatballs are fully cooked and can be used in a variety of recipes. For spaghetti and meatballs, put the meatballs directly into a pot of your favorite tomato sauce and continue to cook in the sauce for another five to ten minutes. Or place them into hot stock for an Italian Meatball soup. These meatballs freeze well. Freeze on a single layer in a dish or pan. Once frozen, place in zip lock bags and place back into the freezer.